To understand the concept behind tankless water heaters, it is first important to understand how a conventional tank-type water heater works. Once you understand it, it is not difficult to see how inefficient this process really is. Traditional electric or gas tank water heaters ("conventional heaters") have been used in commercial and residential properties since the early twentieth century. Conventional electric heaters utilize a simple heating element to heat the water and a basic storage tank to hold the heated water until it is required. Conventional gas water heaters employ a similar system. With the exception of some fairly recent minor gains in the area of insulation and energy efficiency, they have remained virtually unchanged over the years. While the traditional process of heating is simple, it has some major drawbacks. As water is drawn from a conventional tank, cold water begins to immediately flow into the tank. The cold water instantly starts to dilute the heat of the existing water in the tank, effectively reducing its capacity. As more and more water is drawn from the tank, the overall water temperature in the tank continues to drop, eventually becoming too cool to use comfortably for most applications (showering, etc.). Because of this inefficient process, if you have, for example, a 50-gallon tank, you actually only have only about 35 gallons of useable hot water (or less). Of course, once a conventional heater runs our of hot water, you must also wait a considerable time for the heater to bring all of the water in the tank back up to a usable temperature. The speed at which this is accomplished is commonly referred to as the "refresh" rate. To increase the refresh rate and reduce the effect of temperature declines during drawdown of the hot water, traditional water heaters are often set at very high temperatures - 130 to 140F, or even more. This temperature is typically far higher than what would be comfortable or safe for showering or other household uses. You must first pay to heat this water only to cool it again by adding cold water to make it comfortable for use. In other words, you are paying for electricity which heats the water to a much higher temperature than you will ever actually use. Furthermore, you must pay to keep the water in the tank hot all day, not just for the few minutes of each day that it is actually needed. This results in a substantial amount of wasted energy - and wasted money too! In addition, a conventional heater is consistently radiating heat (thermal heat loss), which also contributes to the re-heating rate and energy consumption. This type of heat loss is often referred to as "stand-by" heat loss. Even today's highly-insulated "energy efficient" tanks have a considerable standby heat loss. Most conventional heaters have upper and lower heating elements, one of which is cycling on or off 24 hours per day, even when you're not at home. Using a tank to continually heat and store water is akin to parking your car in your driveway and leaving it running all night at idle until its next use. Simply by eliminating stand-by heat loss alone, energy consumption can often be reduced by 20% to 30%. Another noteworthy problem with traditional water heaters is their susceptibility to minerals, sediments, and age. In hard water environments or in regions with sediment in the water supply, the heating elements of a conventional tank heater can become encrusted with minerals and debris. This contamination gradually reduces the thermal transfer of the heat at the element to the water itself, further reducing effectiveness and eventually causing the element or entire heater to fail. 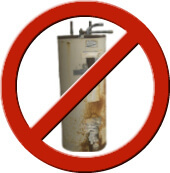 The average lifespan of a traditional tank-type water heater in North America is less than 12 years. Unfortunately, most tanks, once they have reached the end of this short service life, are destined for the landfill - hardly an environmentally-friendly or long-term cost-effective solution. Conventional heaters require a substantial amount of space. Generally located in closet, utility rooms or garages, they consume valuable square footage that could be put to better use.